The day dawns still and clear. There are few tourists at this time of year. It’s hard to imagine this day in 1941 with the beach, the streets, the wharves and the mole teeming with Allied soldiers and more in the olive groves where apartments now stand, even more in the hills. Thousands and thousands waiting for evacuation. Looking from Hotel Ostria over the outer Kalamata harbour and beyond the mole, the bay. After breakfast I catch the No, 1 bus to the railway station. The only trains that come here now are chartered tourist trains and only rarely. I wonder if this is where the POWS were entrained after they were captured, or was it the old station in the park? I follow the railway line south through the railway park to the port. Drivers do not stop for pedestrians at crossings. The just hold their hand on their horn instead. Later I hire a bike from a place almost next to the hotel. 8 euros a day. They will not hire me a helmet. I cycle anyway to the eastern end of Navarinou where the cycle path ends. The hotel owners say I can store it with theirs in the ballroom. I’ll need it early in the morning. I meet Tom and Rowena in the lobby and there is news. The journalist is coming to see us. 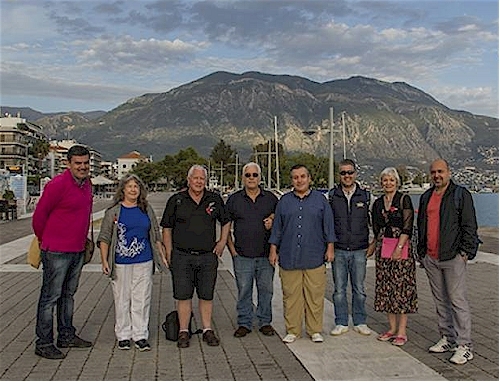 But three people arrive including historians and passionate tourism organisers and educationists, Andreas Zagakos and Konstantinos Adrianopoulos. We talk about why we are in Kalamata and the importance of this very day. They say they’ll be back at 6 pm. 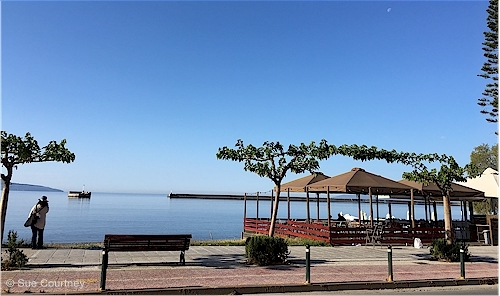 We are going to walk the Battle of the Kalamata Waterfront route. We walk beside the beach towards the port. Wish I had known we were being filmed as we stroll along the inner port promenade. Don’t like seeing myself on camera. Have to stop playing with my hair. Tom is interviewed first and then it’s my turn. I talk about my Dad from Auckland, New Zealand, 18 Bn, 2NZEF, somehow getting separated from his battalion during the chaotic retreat from the Aliakmon Line way up north. The Battalion went east to the evacuation ports at Port Rafina. 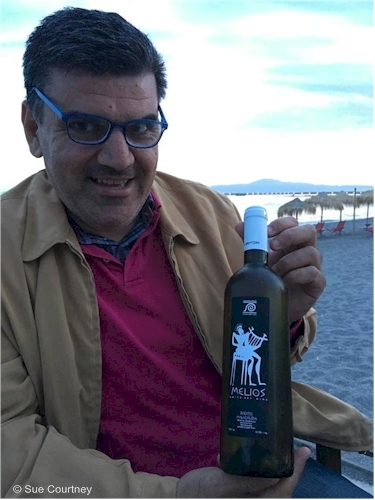 Dad ended up in Kalamata. After the interviews this photo is taken for the paper. We continue towards the Customs House where the Germans first reached the harbour. There is another surprise. Maria is waiting for us. 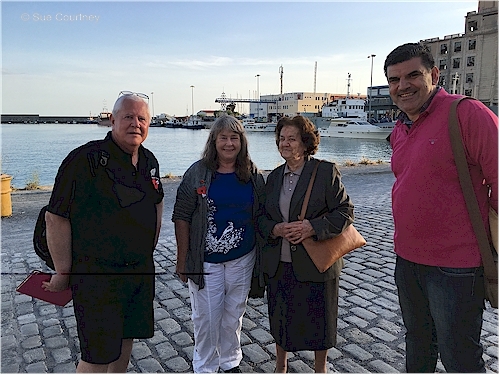 She was 8 years old in 1941 and her memories are mostly of the continuous bombing of the port that started not long after Germany declared war on Greece on the 6th April. Also of chocolates the soldiers gave her, and after the evacuation, stories of soldiers hiding in the hills. We stroll back along Navarinou for about a kilometre-and-a-half to Andreas’s restaurant Sto Kyma – The Wave. We are joined by other historians including Ilias Bitanis who writes local history articles for the paper. The food at Sto Kyma is generous with plate after plate of local delicacies and the biggest olives I have ever seen – Kalamata olives of course. The wine at Sto Kyma is not some anonymous house wine served in a jug either. I’m delighted there is real wine here. It’s a fabulous end to a special day. Later, as I’m going to bed, I wonder if my Dad knew at the same time on the 28th April 1941, that this would be his last night of freedom for over four years. 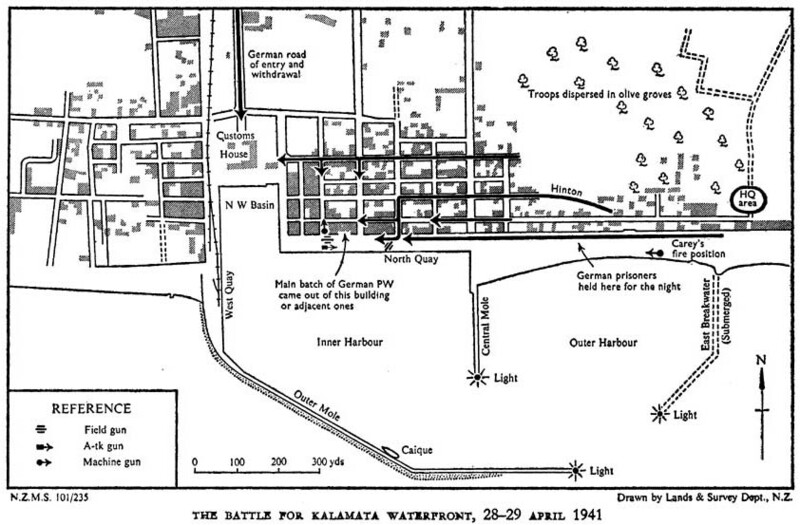 *Further Reading: “The German Advanced Guard enter Kalamata” from To Greece by WG McClymont, one of the volumes in New Zealand’s official history of WWII. 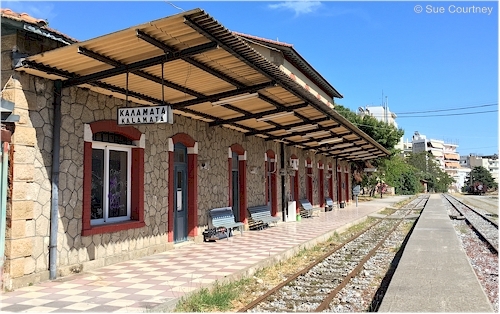 This entry was posted in Greece, Travel and tagged 1941, 2016, Battle of Kalamata, historians, Kalamata, POW by Sue Courtney. Bookmark the permalink.